In the list below, you can find many hotels and motels located throughout Tybee, Georgia, Savannah’s beach. You will find anything from lavish ocean front beach resorts, to quaint little motels by the sea, you and your family or friends will be sure to find the perfect accommodations for your vacation on Savannah’s beach right here. This beachfront Tybee Island, Georgia hotel features an outdoor pool and free continental breakfast. Free Wi-Fi is available. Tybee Island Lighthouse Station and Museum is a 4-minute drive away. The front desk is open 24 hours for added convenience at this Tybee Island Desoto Beach Hotel. Free parking is available. Featuring free WiFi throughout the property, Admirals View Tybee Island offers accommodations in Tybee Island. Free private parking is available on site. Just a 5-minute walk from the beach, this Georgia hotel is 2 miles from the Tybee Island Lighthouse and Museum. Guests have access to free Wi-Fi and a daily continental breakfast. The Beach House at the Dunes is on Tybee Island in Georgia, right on the beach. Each rental apartment features a full kitchen and guests have access to an outdoor pool. In Tybee Island, Georgia, this beachfront bed and breakfast features an outdoor pool and a daily hot breakfast. Free Wi-Fi access is available. In Tybee Island, Georgia, this vacation home features an outdoor swimming pool and a full kitchen. Free Wi-Fi access is available. An oven, refrigerator, and kitchenware are provided in the kitchen at BeSoto Beach Bungalows. A flat-screen cable TV is also included. This all-suite Tybee Island hotel features beach access and free property-wide Wi-Fi. Every room has a full kitchen. Historic Tybee Island Lighthouse is a 4-minute drive away. In Tybee Island, Georgia, this guesthouse features an outdoor swimming pool. Free Wi-Fi access is available. A full kitchen is included in each room at DeSoto Beach Terrace. Cable TV is included along with towels and linen. Select rooms have an ocean view. A game room is on site. 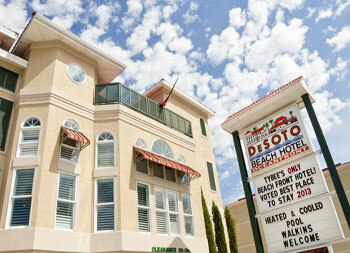 At DeSoto Beach Terrace, there is a 24-hour front desk. This Georgia hotel is within a 3-minute walk of the beach and 18 miles from historic downtown Savannah. Guests can enjoy a seasonal outdoor pool, free Wi-Fi, and continental breakfast throughout their stay. This beachfront resort is 4 minutes’ walk from Tybee Beach Pier and 6 miles from Fort Pulaski. Guests of Hotel Tybee will enjoy 2 outdoor pools. All accommodations at Hotel Tybee feature a balcony, cable TV, and either an ocean or pool view. Some rooms include a desk and dining area. In the heart of Georgia, these Tybee Island accommodations are 1 miless from picturesque Tybee Isle and Light Station and Museum. Guests can enjoy beachfront access and an outdoor pool. Just a 5 minute walk from Tybee Beach, this Tybee Island motel features an outdoor saltwater pool. Rooms offer a simple design and come with free Wi-Fi and a cable TV. On Tybee Island, this Georgia beachside hotel is less than 1 milesss from the Beach Pavillion. Guests can enjoy an outdoor pool, on-site bar, and free in-room Wi-Fi. This Georgia resort features a beachfront getaway 2 miles from Tybee Island Light Station and Museum and a 15-minute drive from historic Savannah. Guests have access to the beach and an outdoor pool. In Tybee Island, Georgia, this bed and breakfast features an outdoor swimming pool. A daily breakfast and free Wi-Fi are provided. It is a 2-minute walk from the beach. Offering a private hot tub, The Gardens is located in Tybee Island, Georgia. Tybee Island Pier is 1.3 miles away from the apartment. The living area includes a seating area and a TV with DVD player. The fully equipped kitchen features a stainless steel oven, stovetop, microwave, and refrigerator. On the shores of the Atlantic Ocean, this beachfront property is a 30 minute drive from historic downtown Savannah. Features include 3 outdoor pools and a children’s activity center. Tybee Beach Resort Club by Beachside Colony is an oceanfront property, located 25 minutes’ drive from Savannah historic center of the city. This resort features an outdoor pool and a restaurant on site. This homey seaside bed and breakfast is a 5-minute walk from Tybee Island Beach and half a mile from the Tybee Lighthouse. It offers landscaped gardens and private balconies.